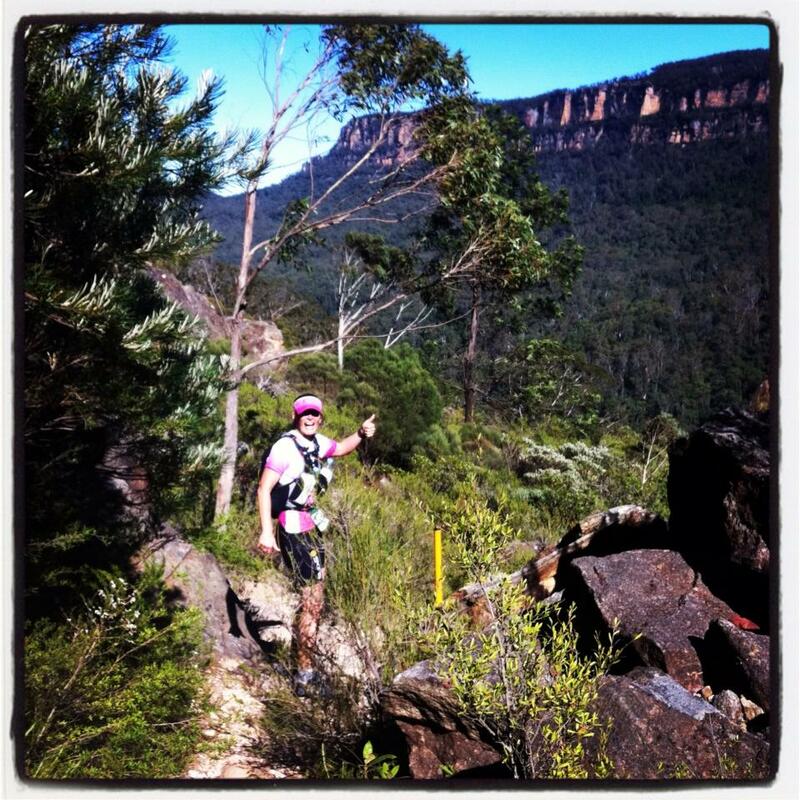 This year, Wild Endurance was held on the 4-5 May in the Blue Mountains. 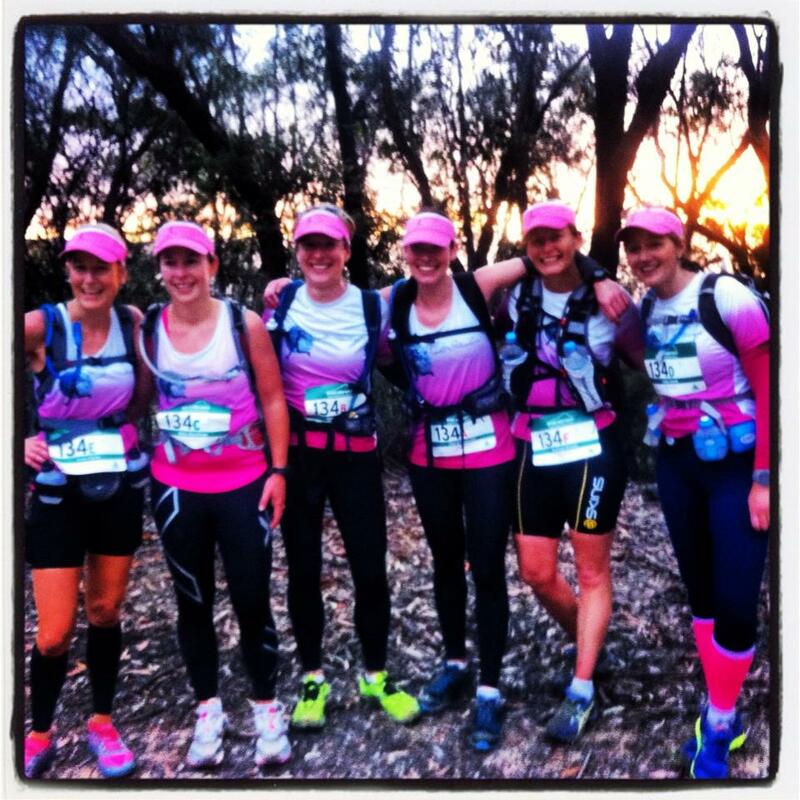 Teams of between 3 and 7 took on the 50km or the 100km (36 hour) team challenge…. Not a relay… everyone in the team going the whole distance! I was proud to be a part of the ‘Night Striders’ team, along with Helen Cornwell, Cheryl Hayward, Kellie Smith, Holly Wyndham and Rachel Shields. We decided to take on the 50km challenge, as half of our team were yet to complete a marathon. Months of training went into this event, along with countless hours trialling camelbacks, gear packs, trail shoes and an assortment of gear that we were not really familiar with until this event. With lots of advice under our hydration belts, and sporting brand new hot pink matching Night Strider jackets, I think we were feeling adequately prepared but not really sure what we were in for when we arrived in Katoomba on the Friday afternoon. We had all of our compulsory gear checked and attended the Carbo-loading dinner at the Carrington Hotel on Friday night. I have to admit I wasn’t expecting much, loads of cheap spaghetti and plain napoletana sauce. But the eggplant dish was delicious! I had to stop eating it, and tell myself to eat something with more carbs. A nice piece of some yummy hazelnut chocolate mousse cake finished it all off. After that we made our peanut butter sandwiches for the morning, and packed all of our compulsory gear into our packs: 2 litres of water, at least 500 calories of food, thermal top and pants, beanie, rain jacket with hood, fluroescent safety vest, headlamp, first aid gear… I was starting to worry how I would fit all this gear into my bag! In the end, I had to pack my water belt too, to help carry some of the extra water and food. We left Katoomba at about 5am on Saturday morning, headed for Dunphys Camp, AKA middle of nowhere. Somewhere in the Megalong Valley. Our start time wasn’t until 8am, but we had to arrive nice and early to check in as a team, have our gear checked again, and scrub our shoes free from any moss/etc that could contaminate the beautiful environment that we were about to run through. I think it was about 13 degrees c at 7am, certainly not as cool as I had anticipated it would be. That didn’t stop Helen from keeping warm by wrapping herself in Holly’s cuddly blanket. After posing for a few team shots, it was time to move towards the start line. There were 2 waves, half an hour apart. We were in the first wave, as we anticipated running the event. A lot of teams planned on walking. The split start was to try to alleviate some of the bottleneck points on the course. The race started precisely at 8am, and after about 50 metres of running, we were met with our first sharp ascent. The path was steep and gravelly – about a minute into the race and I already felt like I was going backwards. This was going to be harder than I anticipated! Thankfully this didn’t last for long, and soon we were running on the wide fire trails of Medlow Gap. We talked to many of the teams around us at this point, as nobody was really pushing hard at this point, just running along nicely. 3km into the race, I became the first (and only) team member to stack it, and end up in the dirt. But no blood was shed, a quick dust-off and we were on our way again. 7km in to the race, we turned off the fire trail and started to head uphill towards Mt Derbert. This was the start of the part of the race that I refer to as the 3 ‘vertical kilometres’. It started off with stairs… lots of stairs, about a kilometre of them, up to Mt Derbert, then to Little Cedar Gap, and then to the Tarros Ladders – Who knew rock climbing was part of this? (Not me, because I didn’t read the course description beforehand). This was a bit of a bottleneck, lucky when we arrived at the ladders there were no teams waiting, so we didn’t lose time here – and sorry to the teams behind us, who had to wait while we climbed the 14 metre high cliff. At the 2 hour mark we had only completed 12km, but were feeling good. From here the trails continued as wide fire trails, until around the 20km mark, where we reached the golden stairs, and proceeded down, down, down through the Blue Mountains National Park. By this time, our GPS watches were a little thrown off, due to the terrain (which we anticipated), so we were a little unsure just how far we had to go to our first checkpoint. By this time, I’d had about 750ml of water, 1 GU gel and some lollies, and was feeling good, but we were all getting a bit hungry. We continued along the beautiful trails, through Scenic World, until we reached the Furber steps. These steps were actually not as bad as I had anticipated – they were spaced far enough apart that you didn’t always have to lead up the steps with the same leg, which for me, meant that it was not as hard on the legs as I thought it might be. Waiting near the top was our wonderful support team, Michael Kim, Vlad and Phil. They cheered us on up the final part of the steps and across the road to the Katoomba Oval, checkpoint one! Our support crew had done an amazing job for us, and had a 2xU tent set up for us next to the oval – we were definetly the most professional looking team. Inside was all sorts of food waiting for us – My choice was olive sourdough, but I also saw 2 Minute noodles, rice cakes, potato chips, sandwiches and snickers being devoured. We refilled our water bottles, filled our pockets with more lollies, reapplied our suncreen and made our bathroom stops. Then, 26 short minutes later, we were on the road again. Our support crew cheered us on as we disappeared down the stairs towards Katoomba Cascades – it would be at least 4 hours until we saw them again. Down the stairs… up the stairs… past Echo Point… down the stairs again. We met our first little bit of frustration here, as the staircases were narrow and there were a lot of tourists around, oblivious to the fact that there was an event in progress, who did not give way. Now, I know the event handbook said we should give way to them, but come on! “We’re in a race people! Let us through!” An event marshal or 2 certainly could have helped out here. On the next part of the course, teams we passed continued to tell us that we were the best looking, most co-ordinated team they had seen all day. 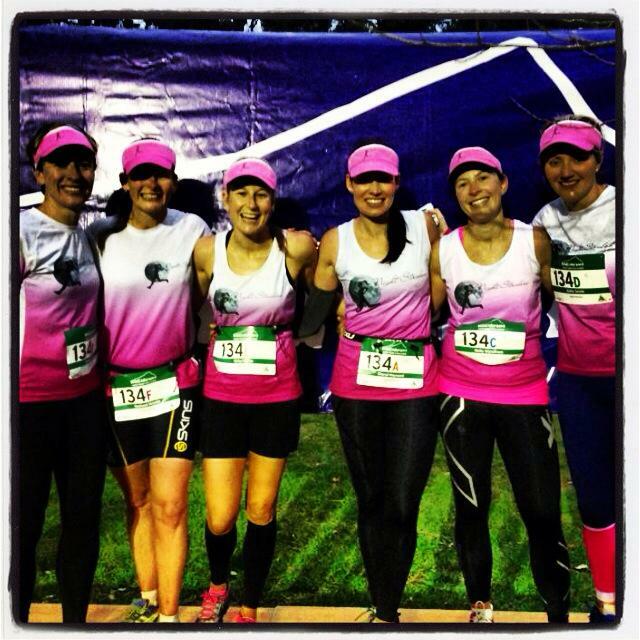 (We all had on our matching pink Night Strider singlets and visors). Our response: You should see us on a Tuesday night! Along Federal Pass, and in to Leura Forest. Rachel had to stop here to Hug a Tree. Literally. At this point, most of the technical trails were over, and the last 10km or so of the race was back on wide fire trails. We came across a creek, and stopped to look for a way around it. After deciding it was not safe to try to dodge the ankle-deep water by trying to jump across wet rocks, straight in we went. Expecting to run the rest of the race with wet feet, I was pleasantly surprised to find that my trail shoes were waterproof. With around 5km to go, we were met by 2 of our support crew, Vlad and Phil, who really lifted our spirits for the last 10% of our journey. They had run down to meet us from the finish line, and said there were a few teams just in front of us. “And from the looks on their faces, they certainly were not enjoying these hills.” The last km of the course flattened out. With the sun setting, and ugly black clouds rolling in overhead, we attempted to belt out ‘We are the Champions” as we neared the finish line. I was so glad we were nearly done, but spared a thought for the 100km entrants. They were only just nearing the halfway point, and had a long, cold night ahead. We were met by the rest of our support crew, Michael and Kim, about 500m from the line, and the 10 of us jog-walked our tired bodies to the line, finishing just before dark, 9 hours and 18 minutes after we started, and only 2 hours behind the winning team. We were very happy to stand on that finishers podium and have our pictures taken, as the 5th overall complete team to finish, and the third-placed all female team. Go Girls! In an event that we didn’t even plan to ‘race’, the goal was simply to get to the finish line, together. This was a phenomenal result. We Raised $2510 for the Wilderness Society, a big thankyou to everyone who sponsored us, came to fundraising events, helped sell or eat our chocolates, and of course the biggest thanks goes to our phenomenal support crew, Vlad, Phil, Kim and Michael – We could not have done it without you! See you next year Wild Endurance! The biggest question is… 50km?.. or 100km? Congratulations on an absolutely awesome result!